Located around 80 kilometers from Lijiang, Tiger Leaping Gorge at the upper reaches of Jinsha River is composed of the Upper Tiger Leaping Gorge, the Middle Tiger Leaping Gorge and the Lower Tiger Leaping Gorge. With a vertical height difference of over 3,900 meters, the gorge is one of the deepest gorges in the world. The Upper Tiger Leaping Gorge lies in the area of Lijiang, offering full tourist facilities. The middle and the lower section are not equipped well. Considering the safety, it is recommended that you explore the Upper Tiger Leaping Gorge. If you would like to challenge yourself, you could also discover the Middle Tiger Leaping Gorge. The Upper Tiger Leaping Gorge is the narrowest section. The narrowest part of Jinsha River is some 30 meters wide. It is located at the Upper Tiger Leaping Gorge. A huge stone lies at the heart of the river at the Upper Tiger Leaping Gorge, separate the rapids into two parts. 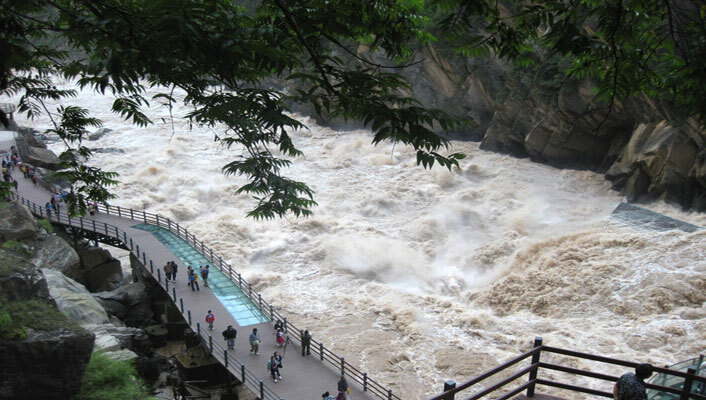 The section offers a 2-kilometers-long wooden plank road to visitors to admire the stunning views of the rapids along the Upper Tiger Leaping Gorge. The views at the Middle Tiger Leaping Gorge and the Lower Tiger Leaping Gorge are more breathtaking than those at the Upper Tiger Leaping Gorge. However, hiking at the two sections are more dangerous. The downhill stairs at the Middle Tiger Leaping Gorge is almost vertical. Generally speaking, it always takes around 2 hours to hike from the top of the gorge to the bottom of the gorge. Jade Dragon Snow Mountain is located to the east of the gorge. The best time to visit Tiger Leaping Gorge is in the morning. The best months to visit are from June to September. There is no direct bus from Lijiang to Tiger Leaping Gorge. The only option is to rent a vehicle. Please take enough drinking water, an umbrella and food with you. Please wear the sunscreen cream, sunglasses, and hats. Please do not stand so close to the river in case that that rapids pull you down into the river. If you are interested to explore the Middle Tiger Leaping Gorge, please take care of yourself during hiking. Interested in visiting Tiger Leaping Gorge on a Tour? Wendy Wei Tours offers a variety of different packaged tours as well as custom tours including Tiger Leaping Gorge, among other attractions and destinations. To find out more, please visit our Tours page or Contact Us directly to find out more.